Have you ever had one of those days (or weeks) where everything seemed to go wrong? Well, recently I went through one of those periods when I caught a stomach bug. The stomach flu is a highly contagious illness, so much so that it can spread rapidly in closed quarters, such as offices, hospitals, schools, and even childcare facilities. There are approximately 20 million Americans who get the stomach flu every year. It took me a few days to recover from the stomach flu; however, for many Americans with impaired immune systems, it can be deadly. Contradictory to its name, the stomach flu is not actually “the flu” that most people talk about. That means the flu shot won’t protect you against the stomach flu. The actual medical term for the stomach flu is called gastroenteritis. It is a viral, bacterial, or parasitic infection that causes your intestines and stomach to become inflamed and irritated. Stomach virus: That being said, the most common cause of gastroenteritis in the U.S. is a virus. The type of virus that causes your stomach flu will depend on the time of year. The rotavirus commonly occurs in the winter; it begins around November and ends in March. Adults will often attract the condition after contact with an infected infant. The norovirus can infect anyone at any age, and outbreaks commonly occur between November and April in the U.S. Astrovirus generally occurs in the winter, and it usually affects infants or young children. Adenovirus typically affects children under the age of two, and infection may increase during the summer. Enterovirus and cytomegalovirus are other viruses that can cause a stomach infection in those with compromised immune systems. Bacterial stomach flu: Although bacterial gastroenteritis is less common, certain bacteria can still cause the stomach flu and food poisoning. Bacterial causes of gastroenteritis include Escherichia coli (E. coli) found in salad and ground beef, campylobacter (found in poultry and meat), Salmonella or Staphylococcus (found in eggs, dairy products, and meat), Yersinia (found in pork), and Shigella (typically found in swimming pool water). Parasitic stomach flu: Parasites can also cause gastroenteritis, including cryptosporidium and giardia lamblia, and the infection can last several weeks. The parasitic stomach flu is often waterborne, and it can be transmitted through lakes, hot tubs, and swimming pools. Parasitic stomach flu outbreaks also occur in daycare centers. Other parasitic infections that cause the stomach flu include cyclopora, trichinella, Cytoisospora belli, and Enterocytozoon bieneusi. Other stomach flu causes: Other stomach flu causes include water contamination from sewage, improper hand washing, and the consumption of undercooked or raw shellfish, especially from contaminated waters. Having the stomach flu is definitely not fun. Stomach flu symptoms often vary, and the onset is sudden. The symptoms associated with the stomach flu include vomiting, watery diarrhea, nausea, and anorexia. Other symptoms may also include headaches, mild fever, abdominal cramping or bloating, chills, muscle aches with fatigue, and stomach pain. Dehydration can also occur. Signs of dehydration include lightheadedness, dry mouth, thirst, and dry skin. Symptoms you may also experience with the bacterial stomach flu include loss of appetite and bloody stools. Parasitic stomach flu will also often produce chronic or subacute diarrhea. Weight loss and fatigue is also common whenever there is consistent diarrhea. How to Prevent the Stomach Flu? Wash your hands with soap and water often, especially before preparing food or after using the bathroom. To prevent waterborne parasitic infections, avoid swimming, especially when diarrhea is an issue. People with compromised immune systems and infants who are predisposed to developing severe Salmonella poisoning should avoid common Salmonella carriers, such as birds, reptiles, and amphibians. Travelers should avoid contaminated food, water, and ice cubes. Wash your vegetables and fruits thoroughly, while also avoiding undercooked or raw foods. Two live vaccinations are available for preventing the rotavirus. They are considered effective against most of the strains responsible for the stomach virus. It is always important to get plenty of rest and adequate water consumption. People who experience vomiting should take small sips of water; however, if diarrhea or vomiting is prolonged, or if the person experiences severe dehydration, intravenous electrolytes may be necessary. Your doctor may recommend anti-nausea drugs, or antibiotics for bacterial stomach flus. Anti-parasitic drugs like nitazoxanide and metronidazole are also used to treat the parasitic stomach flu. However, there are plenty of natural stomach flu home remedies as well. 1. Probiotics: Dairy products are often not good for stomach problems; however, some foods contain probiotics that help promote digestion and balance the good bacteria in the gut. Kefir is a combination of kefir grains and goat’s milk. Other good probiotic choices include sauerkraut, miso soup, tempeh, kimchi, and kombucha tea. Probiotic strains like lactobacillus may help shorten the duration of diarrhea by up to a day. According to an article published in the Journal of Nutrition in 2000, probiotics can effectively treat various gastrointestinal disorders, such as viral and bacterial diarrhea, especially when caused by Salmonella, rotavirus, Shigella, and E. coli. 2. Ginger: The potent anti-inflammatory compounds in ginger called gingerols are thought to help aid digestive problems, especially a stomach virus. It is also a natural antiviral that helps relieve several symptoms associated with the stomach flu, including abdominal cramps, vomiting, nausea, and bloating. It will also help decrease loose stools. Ginger can also be used in a variety of ways. For example, you can prepare ginger tea with ginger root, take ginger capsules, or simply chew on a piece of ginger root. People with hypertension should avoid ginger. 3. Peppermint: Peppermint essential oil contains menthol. It is a volatile substance with antispasmodic effects that can help sooth the digestive tract. A 2013 study published in the Mymensingh Medical Journal found that peppermint oil could effectively relieve the abdominal pain associated with diarrhea. 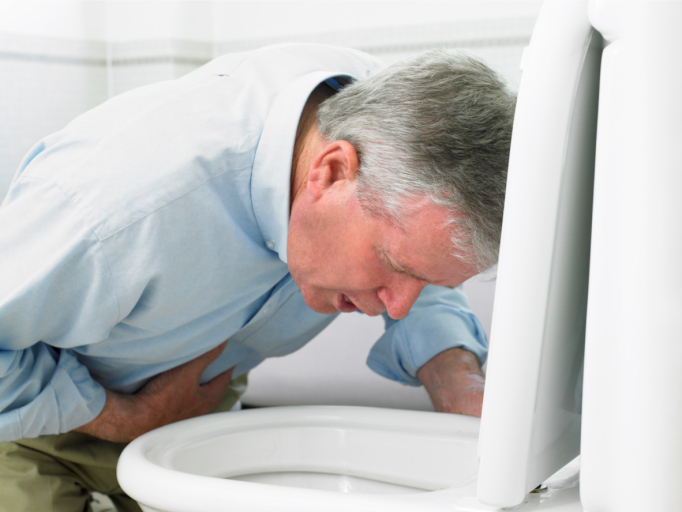 Many of the symptoms of gastroenteritis are similar to irritable bowel syndrome (IBS). In a 2007 study published in the journal Digestive and Liver Disease, researchers found that peppermint oil could improve the abdominal symptoms in IBS patients. 4. Cinnamon: Cinnamon has an antibacterial effect against potential causes of bacterial gastroenteritis, including Campylobacter, Salmonella, and E. coli. In a study published in the journal Lab Medicine in 2009, researchers found that the cinnamaldehyde in cinnamon could be effective against adenovirus stomach virus. Cinnamon is also known to reduce bloating and nausea. 5. Chamomile Tea: Chamomile is another effective natural remedy for gastroenteritis, since it has antimicrobial, anti-inflammatory, and carminative properties that help improve your digestive system. Chamomile has long been valued as a digestive relaxant, and it can treat various gastrointestinal disturbances, such as vomiting, gas, abdominal cramping, diarrhea, and nausea. Chamomile tea is an excellent digestive remedy. To make chamomile tea, simply add one tablespoon of fresh chamomile or two tablespoons of dried chamomile to a cup of boiling water, and let it steep for 10 to 15 minutes. Then strain, and add lemon juice for even more digestive benefits. Drink chamomile tea three times daily for two to three days when you have a stomach virus. 6. Aromatherapy: Aromatherapy also provides great natural stomach flu remedies. It is an alternative medicine that uses essential oils and other plant compounds. There are several essential oils with antibacterial properties that can help treat vomiting, nausea, and IBS. Besides peppermint oil, other essential oils used to treat digestive problems include spearmint, lemon balm, and coriander extracts. According to a comparative study published in the journal BMC Complementary & Alternative Medicine in 2013, the essential oils are also effective against E. coli. Other essential oils commonly used for digestive issues include allspice, French basil, cardomon, cascarilla, German and Roman chamomile oil, clove bud, sweet fennellavandin, lavender, nutmeg, black pepper, sandalwood, rosewood, and rose. 7. Apple cider vinegar (ACV): This type of vinegar is thought to relieve stomach flu symptoms. ACV is high in a soluble fiber called pectin, which helps soothe upset stomachs and reduce vomiting, nausea, gas, and stomachaches. It also helps balance pH levels in the stomach. Make sure to use organic, unfiltered, and raw ACV. It is a good idea to add a teaspoon of ACV to a glass of warm water and consume it 30 minutes before your meal. You will likely have to drink it daily until your stomach flu symptoms disappear. 8. Garlic: Garlic and herbal garlic tea are also used in the treatment of stomach viruses. Garlic contains antibacterial and antimicrobial properties. It is known to soothe the bowel lining and stomach, and it can help relieve stomach flu symptoms such as cramping. Allicin is one of the active ingredients found in garlic. In a 1999 report published in the journal Microbes and Infections, allicin was found to exhibit antibacterial activity against E. coli strains and anti-parasitic activity against parasites, like giardia lamblia. 9. Bananas: The high content of amylase-resistant starch found in bananas can help reduce stomach flu symptoms. Bananas also contain the important electrolytes magnesium and potassium, which help improve digestion. Potassium is often lost during diarrhea. Bananas contain the soluble fiber pectin that is helpful in the treatment of diarrhea. Green or ripe bananas can be eaten to help relieve diarrhea. Some studies suggest that bananas are part of a useful combination against gastroenteritis that also includes rice, applesauce, and toast. 10. Acupressure and acupuncture: In China, acupuncture is commonly used to treat gastrointestinal symptoms, including diarrhea and gastroenteritis. In a 2012 study published in the journal Klinische Padiatrie, acupuncture treatment was considered an acceptable method to treat vomiting in 13 children with gastroenteritis and pneumonia. Acupressure is also considered an effective treatment for nausea and vomiting. The acupressure point P-6, or neiguan, is especially helpful. It is located on your inner arm. Simply place your first three fingers of your opposite hand and cross your wrist. Then, place your thumb on the point below your index finger. You should feel two large-sized tendons under your thumb. Use your thumb and press firmly on the point with a circular motion for about three minutes. Finally, repeat the motion on your other wrist. There are also other natural stomach flu remedies such as turmeric, fennel seed tea, rooibos tea, thyme tea, Celtic sea salt, asafetida, basil, marshmallow root, slippery elm, L-glutamine, N-acetyl-glucosamine, betaine HCl, pepsin, and elderberry extract. The vitamin C in lemon juice can also help kill pathogens related to diarrhea, and baking soda is considered a natural antacid that can help decrease diarrhea and vomiting. It is also a good idea to avoid dairy products, coffee, spicy foods, and high-fat foods. They will make you feel worse by increasing dehydration in the body. People with a stomach virus should always stick with homemade meals, and it is best to have several small meals during the day to avoid putting stress on the digestive system. “Home Remedies for Stomach Flu,” Top10 Home Remedies web site; http://www.top10homeremedies.com/home-remedies/home-remedies-stomach-flu.html, last accessed August 31, 2015. Pietrangelo, A., “Viral Gastroenteritis,” Healthline web site; http://www.healthline.com/health/viral-gastroenteritis#Overview1, last accessed August 31, 2015. Boyce, T.G., “Overview of Gastroenteritis,” MSD Manual Consumer Version web site; http://www.msdmanuals.com/home/digestive-disorders/gastroenteritis/overview-of-gastroenteritis, last accessed August 31, 2015. Boyce, T.G., “Overview of Gastroenteritis,” MSD Manual Professional Version web site; http://www.msdmanuals.com/professional/gastrointestinal-disorders/gastroenteritis/overview-of-gastroenteritis, last accessed August 31, 2015. Rolfe, R.D., “The role of probiotic cultures in the control of gastrointestinal health,” Journal of Nutrition, February 2000; 130(2S Suppl): 396S-402S. Cappello, G., et al., “Peppermint oil (Mintoil) in the treatment of irritable bowel syndrome: a prospective double blind placebo-controlled randomized trial,” Digestive and Liver Disease, 2007; 39(6): 530-536. Alam, M.S., et al., “Efficacy of Peppermint oil in diarrhea predominant IBS – a double blind randomized placebo – controlled study,” Mymensingh Medical Journal, 2013; 22(1): 27-30. Liu, L., et al., “The Antiadenovirus Activities of Cinnamaldehyde In Vitro,” Lab Medicine, 2009, 40, 669-674, doi: 10.1309/LMF0U47XNDKBZTRQ. Lawless, J., The Encyclopedia of Essential Oils: The Complete Guide to the Use of Aromatic Oils in Aromatherapy (San Francisco: HarperCollins Publishers Ltd., 2013), 203. Thompson, A., et al., “Comparison of the antibacterial activity of essential oils and extracts of medicinal and culinary herbs to investigate potential new treatments for irritable bowel syndrome,” BMC Complementary & Alternative Medicine, 2013; 13: 338. Ankri, S., et al., “Antimicrobial properties of allicin from garlic,” Microbes and Infections, 1999; 1(2): 125-129. Anders, E.F., et al., “Acupuncture for treatment of acute vomiting in children with gastroenteritis and pneumonia,” Klinische Padiatrie, 2012; 224(2): 72-75. “Acupressure for Nausea and Vomiting,” Memorial Sloan Kettering Cancer Center web site; https://www.mskcc.org/cancer-care/patient-education/acupressure-nausea-and-vomiting, last accessed August 28, 2015. “6 Ways to Prevent the Stomach Flu Naturally,” Cook IT allergy free web site, January 31, 2013; http://cookitallergyfree.com/blog/2013/01/how-to-prevent-the-stomach-flu-naturally/. “Gastroenteritis,” Home Remedies for you.com web site; http://www.home-remedies-for-you.com/remedy/Gastroenteritis.html, last accessed August 31, 2015.